Do you encounter troubles with the process of window washing around your home or business premise? Your struggles are not enough to wipe stains, water streaks and dirt from glass surfaces? 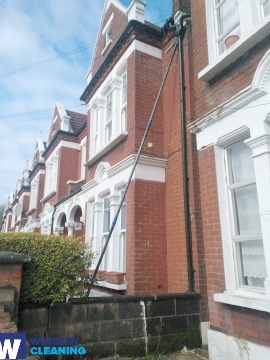 The experts of window cleaning in Alexandra Palace will render you assistance! Say goodbye to the countless hours of polishing and wiping – the skilled and experienced team will handle this problem. You will be able to make the most of your extra time – just let us do this slow and tiresome work for you. Our professional approach will grant you lots of perks. We also provide our professional services in nearby areas: Alexandra Park, Noel Park, Wood Green, Hornsey, Hornsey Vale. We guarantee that the windows of your business premise will be neat and spot-free, like new. Achieve that by just booking our commercial window cleaning. For glass surfaces as high as the fourth floor, we use water fed extension pole equipment which is absolutely safe and effective. London is famous for it's tall buildings. So when it comes to those highly-placed windows we will bring our rope access team. With this sophisticated technique, we can give you end results like no other! The experts have the abilities and the needed equipment to provide you with both domestic and commercial window cleaning. You can rely on us for every kind of glass surface cleaning. For example, we can clean small or double windows, French doors, sash windows, bay windows and patio doors. Moreover, if you have garden glass surfaces, conservatory or roof windows, we can clean them as well. We use the latest ways and the most advanced equipment for all the aforementioned window types. We are happy to use the latest methods to make sure that you receive the finest window cleaning. The glass surfaces of your property will look spotless after we utilise water-fed extension pole cleaning system and high pressure cleaning on them. We use our vehicles to supply the poles with water and we can reach as high as the fourth floor. In case you request cleaning of windows on taller buildings than that, we have rope access cleaners ready to go. Call us on 020 3746 3113 and get in touch with us – these efficient methods will bring you results right away. You will have luminous home after the best window cleaners in Alexandra Palace visit you. We provide the best services for the entire London district. The most modern ways of cleaning are included in our working routine – including water-fed extension pole system and and hard pressure cleaning. You will surely see the change of your home's entire look – we use purified water for the process of in and outside window washing. Contact us today on 020 3746 3113. Our customer representatives will help you and answer your queries. In addition, you can use our on-site booking from.